Reply, 'Mr Wightman Q[uery] Mrs Grieve. Cullen approves Wightman's treatment of her cough, and suggests also using the juice of tussilago leaves. Summary Reply, 'Mr Wightman Q[uery] Mrs Grieve. Cullen approves Wightman's treatment of her cough, and suggests also using the juice of tussilago leaves. 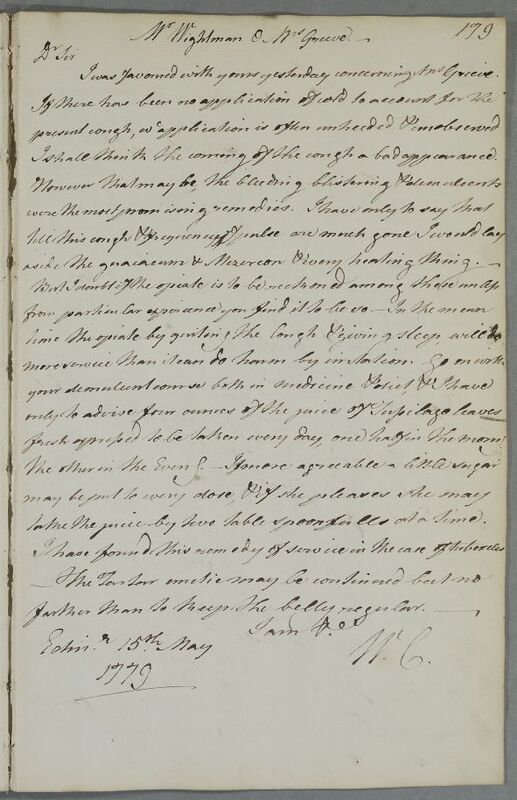 Case of Mrs Grieve who apparently consulted Cullen in winter of 1778-79 for a stomach ailment. She has a long history of arm pains; in February 1777 underwent a partial mastectomy for suspected breast cancer in 1779 develops respiratory difficulties. I was favoured with yours yesterday concerning Mrs Grieve. I shall think the coming of the cough a bad appearance. take the juice by two table spoonfulls at a time.